A system is a star (or two) and a series of objects that revolve around that star. The objects could be gas giants like our Jupiter or small rocky planets like our Mercury. There may also be other non-planetary objects. You will probably find moons around the planets and asteroids/comets zipping around the star in highly elliptical orbits. Just as in biology, a system is made of many parts that all interact with each other. We have a whole section on our system. Because the name of our star is "Sol", we live in the Solar System. While there is a debate among astronomers, we currently have one star, eight planets, and several smaller "dwarf planets". There are also several other large objects and an asteroid belt orbiting the Sun. Our system began to develop several billion years ago with a huge amount of dust and small objects. 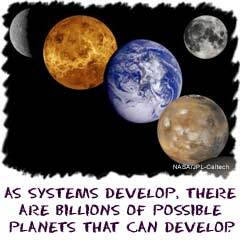 Over time, the star and planets developed. As our technology improves, we are able to see further into the universe and study other stars. Seeing a star is pretty easy, they are bright dots in the sky. Seeing a planet is a lot harder. Since planets don't give off light, we have a tough time seeing them. There are a few ways we detect other planets and possible systems. You might see a big planet because it is reflecting the light of its star. You might see a small shadow pass in front of the star. You might also be able to use a huge amount of math to see if there is a wobble around a distant star. Those wobbles indicate that there are multiple sources of gravity. Those sources may be other planets.